Wealthy San Francisco Neighborhood Fails To Pay Taxes, Loses Private Street : The Two-Way After a series of $14 tax bills went unnoticed, San Francisco auctioned Presidio Terrace off to the highest bidder — a couple from San Jose. They're thinking of charging residents to park there. 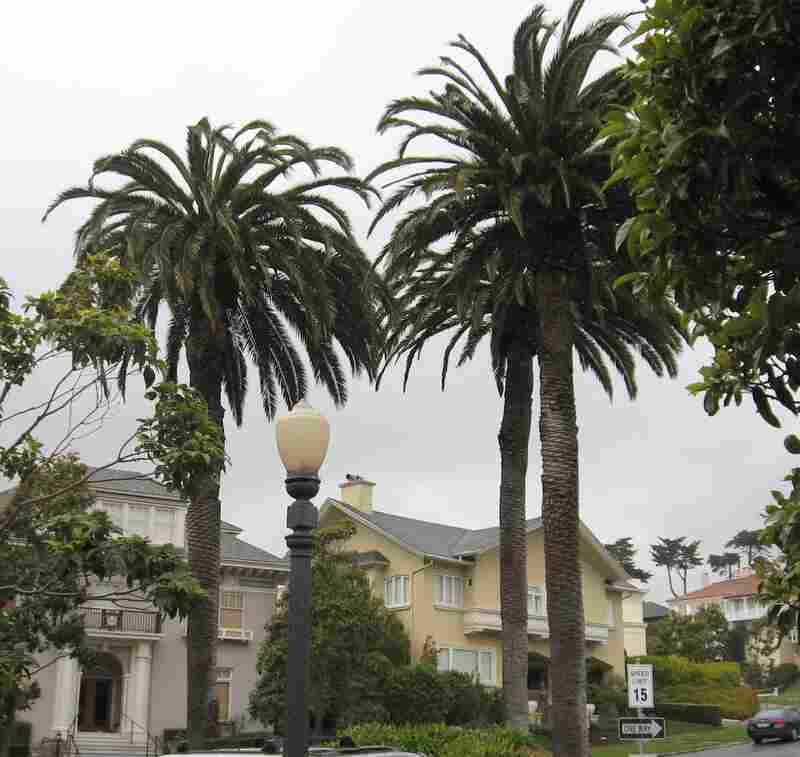 A 2008 photo shows Presidio Terrace, a gated community in San Francisco. A San Jose couple bought the street — a private road — after the homeowners association failed to pay a tax bill. A four-floor San Francisco mansion at 26 Presidio Terrace was recently on the market for $14.5 million; 30 Presidio Terrace, a neighbor in the gated community, last sold for $9.5 million. But Presidio Terrace itself? As in, the street? The strip of pavement these tony residents rely on to reach their front doors? The private road the homeowners association has owned for more than a century? That's a bargain. After the homeowners association failed to pay a $14 tax bill — for three decades — the road went up for auction, the San Francisco Chronicle reports. A San Jose couple snagged it for about $90,000. Tina Lam and Michael Cheng made their strategic purchase in 2015. But now, the newspaper writes, "they're looking to cash in — maybe by charging the residents of those mansions to park on their own private street." Or, lacking that, opening the spots up to the general public. Cheng, a real estate investor who was born in Taiwan, tells the newspaper the couple "got lucky." Lam, a Silicon Valley engineer who emigrated from Hong Kong, says she "really just wanted to own something in San Francisco" because she loves the city so much. The whole story is well worth a read over at the Chronicle. Presidio Terrace was originally built as an enclave for white residents, as Curbed San Francisco noted last year. The Virtual Museum of San Francisco quotes an ad from 1906, bemoaning the fact that Japanese and Chinese residents were moving into neighborhoods and saying: "There is only one spot in San Francisco where only Caucasians are permitted to buy or lease real estate or where they may reside. That place is Presidio Terrace." These days, Presidio Terrace is gated and guarded. SFGate described it as "very private and swank." San Francisco's late former mayor Joseph Alioto used to be a resident, as did Sen. Dianne Feinstein. According to a lawsuit filed by the Presidio Terrace Association, the neighborhood's current residents didn't find out about the sale of their private road until this May — more than two years after it happened. It all started with a $14 bill. Or, well, a lot of $14 bills. The homeowners association says in the lawsuit that based on city records, "the property taxes on the Common Area have been less than $14.00 annually for the past several years." The taxes weren't paid for "many years," the association says, because the city was sending the bills to an address "associated with an accountant who last performed work for the Association in the 1980s." A warning that the account was in default, owing $994.77, was sent to the same address. It, too, went unnoticed. A few months later, the street was auctioned off. The city should have known the address was wrong, the residents say. They're calling for the sale to be rescinded. The office of the treasurer-tax collector does not seem persuaded by that argument. A spokeswoman told the San Francisco Chronicle there was nothing they could do. And, the spokeswoman told the paper, "Ninety-nine percent of property owners in San Francisco know what they need to do, and they pay their taxes on time — and they keep their mailing address up to date."